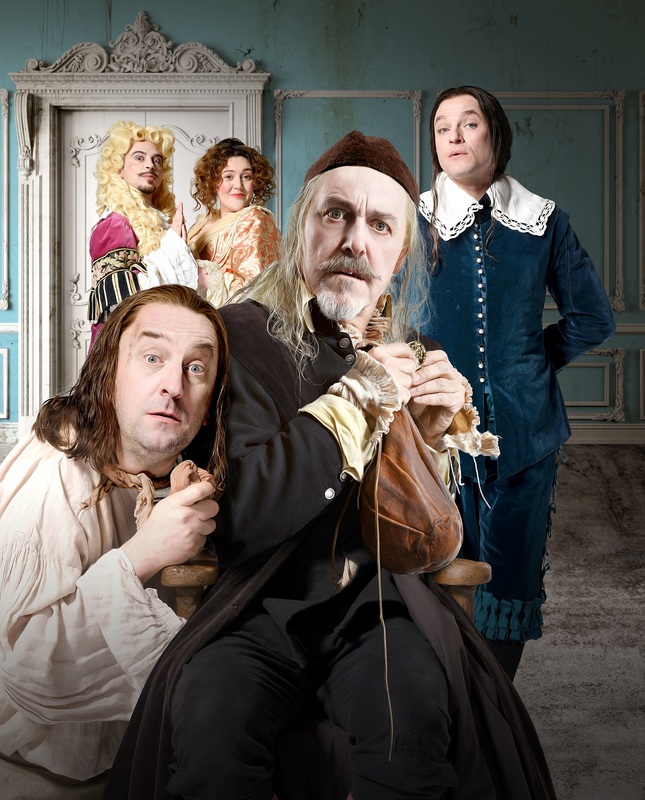 The latest comedy smash to hit the West End is a revival of Moliere’s classic The Miser, featuring a stellar cast of comic talent including TVO regulars Katy Wix and Ellie White – and YOU can win tickets to see it when it opens next month. Actor, writer, presenter, comedian and two-time Olivier award-winner Griff Rhys Jones returns to the West End alongside BAFTA and British Comedy Award winning comedian Lee Mack (Not Going Out, The Mighty Boosh), who is making his West End debut. They are joined by Mathew Horne (Gavin & Stacey, Nathan Barley), Ryan Gage and Andi Osho. Fanatical about protecting his wealth, the paranoid Harpagon (Rhys Jones) suspects all of trying to flinch his fortune and will go to any length to protect it. As true feelings and identities are revealed will Harpagon allow his children to follow their heart, or will his love of gold prove all-consuming? This major revival is directed by Sean Foley, who previously directed revivals of The Dresser (written by Ronald Harwood and starring Reece Shearsmith and Ken Stott) and Jeeves and Wooster. Foley is also responsible for the adaptation’s book, alongside award-winning playwright Phil Porter. You can find out more about the play at themisertheplay.com now. As we previously reported back in December, the play is currently making waves at Bath Theatre Royal, before a stop-over at the Richmond Theatre between 21st and 25th February. Following this, it will transfer to the West End at The Garrick Theatre from 1st March for a limited season that must end on 3rd June – and this is where our competition comes in. The good folk behind the production have very kindly offered us the chance to let one lucky reader see the show for free, with a pair of tickets for any Mon-Thur performance of the show during the opening weeks between 1st March and 13th April. Katy Wix and Ellie White play which real-life mother and daughter pairing in cult sitcom The Windsors? Email your replies to competitions@thevelvetonion.com by 11:59pm on Wednesday 22nd February. One winner will be picked at random, and contacted by the production team to arrange tickets for a performance of their choosing on Mondays, Tuesdays, Wednesdays or Thursdays between 1st March and 13th April. For more details, see the T&C below… and good luck! If you don’t win, or just want to be certain you’ll get to see this much-loved show, you can buy tickets over yonder. This competition offers 1 pair of tickets for any performance of ‘The Miser’ at The Garrick Theatre between March 1st 2017 and April 13th 2017, on Monday, Tuesday, Wednesday and Thursday performances only.. The winning entry will be selected at random, from all who correctly answer the question: “Katy Wix and Ellie White play which real-life mother and daughter pairing in cult sitcom The Windsors?” The winner will be contacted via the email address they use to enter. Details will not be shared with any additional third parties beyond The Velvet Onion, The Garrick Theatre, AKA and the guest-list for the venue. Only entries made to competitions@thevelvetonion.com will be accepted. The Velvet Onion will not accept entries as comments to this post, replies to our Facebook/Twitter pages, comments to any other posts in error or emails to any other email address in our domain, nor any entries received after 11:59pm on Wednesday 22nd February. This competition is being run entirely by The Velvet Onion, with prizes organised by The Garrick Theatre and AKA. One entry per person. Any entrants found making multiple entries from the same IP address will be disqualified, and banned from entering further competitions run by The Velvet Onion. The judge’s decision is final. There is no monetary value to this competition and no cash alternative will be offered. The winner must choose their preferred performance to attend, and dates/performances cannot be changed, though The Garrick Theatre and AKA reserve the right to select an alternate date in correspondence with the winner should their chosen date be unavailable. The winner will be responsible for their own travel and/or related expenses. The Velvet Onion reserves the right to withdraw this competition if any overriding issues arise.